My Garden Essay. Welcome to our website. This is the one of the best and an unlimited the source of Essay and Paragraph. 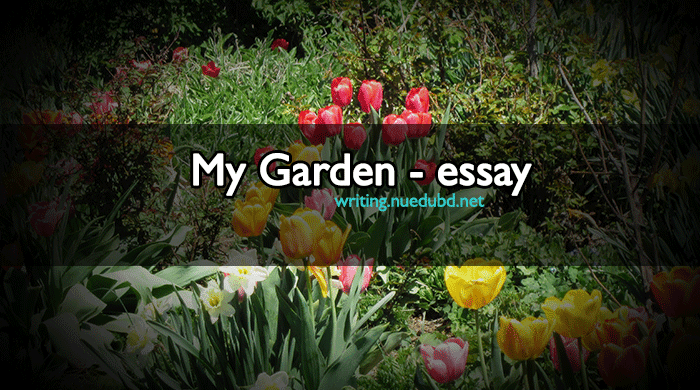 Now NU EDU BD writing section sharing the most useful My Garden Short Essay for you. I hope you'll like it. Education is one of our basic rights. This is a very short and easy essay for you. Now check this out the Short composition on My Garden Essay for you. Introduction: I am a college student. I have made a garden. it is very fine to look at. I work here at my leisure. It gives me peace and satiety. all the members of my family are satisfied with my garden. Reason for making a garden: I come from an agricultural family. My father is a farmer. We have a rich agriculture background. Since my consciousness, I have been acquainted with farming. I have cherished a dream to make a garden. In keeping with this mentality, I have made a garden. I like this garden in my heart. to remove the monotony of my life and keep myself close to nature, I have also felt an urge to make this garden. My parents and elder sister also inspire me to make it. Description of my garden: My garden is varied beautiful to look at. It is full of plants and trees. It is enclosed tightly so that goats and naughty boys cannot enter into it. It has a nice system to bear water into it from our pond. I work here in the afternoon. sometimes my father employs labor to work in my garden. my sister also works with me. We laugh about it and make the soil loose. We weed out the plants and give water. my garden has three sections. Each section contains drains to carry water. Different Kinds of fruits and flowers: I have planted different types of fruits, Flowers and vegetables in my garden. Among the mango, The jackfruit, the guava, and the blackberry are mentioned able. The flowers include rose, merry-gold, Rajanigandha, Kamini, henna etc. The vegetables include seasonal plants. All These types of plants and trees grow in my garden well in a planned way. Care and protection: My garden stands in the main position of our house. Every inmate of our family can take care of it. My father has entrusted me with the task of taking care of this garden. I work here and keep strict vigilance on it. My mother and elder sister also take care of my garden. I protect it from any evil intruders. I manure my garden and prune the trees. Every one of my house makes the garden a rare one. Benefits: My garden serves a great purpose to us. It gives everything selflessly. My father takes his morning and evening stroll in this garden. Whenever I go to my garden I feel highly relaxed. My joys know no bounds when the full bloomed flowers waver in the wind. I a highly charmed at the sweet-scented flowers. My garden adds to the beauty of our house. When the flowers brighten in the sun, our house seems to be a paragon of beauty. My sister sometimes decorates our house with the flower from my garden. This garden removes the monotony and dullness of my mind. It refreshes my mind and keeps me aloof from the bad company. It removes my tension and strengthens my mentality. Again my garden is a source of our family economy. It provides the fruits by which we fulfill our family demand. We sell a lot of fruits, flowers, and vegetables. We can earn money from this. Thus, my garden serves a great role for our family. Conclusion: My garden embellishes our house. I get relaxed here. I work earnestly. It boosts our economy. I am highly proud of this garden.My Garden is a source of health, wealth and enjoyment for all of us.